The Green Girl headed over to the grand opening of the Performance Bikes Long Beach store this morning. It was advertised that the first hundred customers would receive a $20 money card. The store opened at 9 am but there was already well over a hundred people in line when I arrived at 8:30 am. I decided I would stick out the line for a chance to win prizes from spinning the wheel. Us back of the liners were thrilled when they ended up giving every single customer in line a $20 money card. Some people opted to bypass the wheel spinning line and headed into the store. I was determined to win something cool so I waited patiently in the line that wrapped around the store. 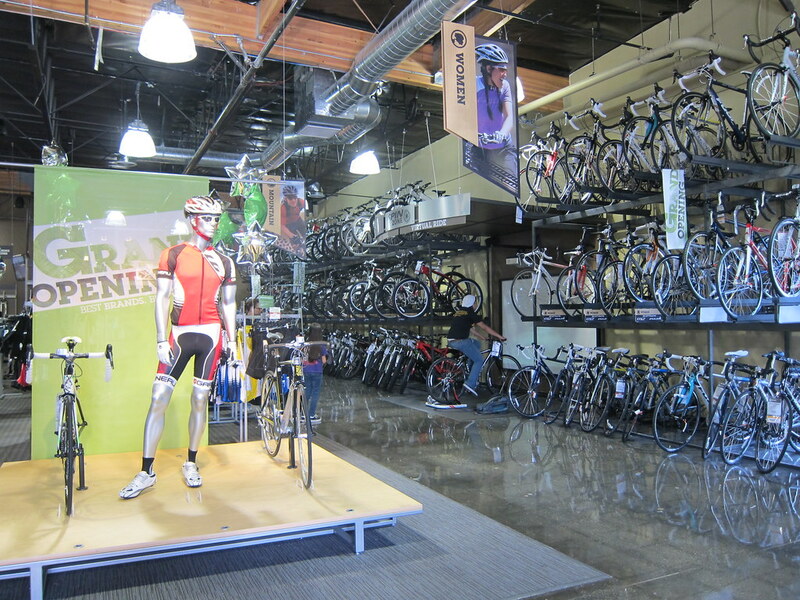 The right side of the store was covered by a three-tier wall of bikes. Accessories filled shelves on the left and apparel was featured in the center of the floor. In the back, there was the Spin Doctor Bike Repair service center with a shiny new pegboard wall and tools with bright blue grips. 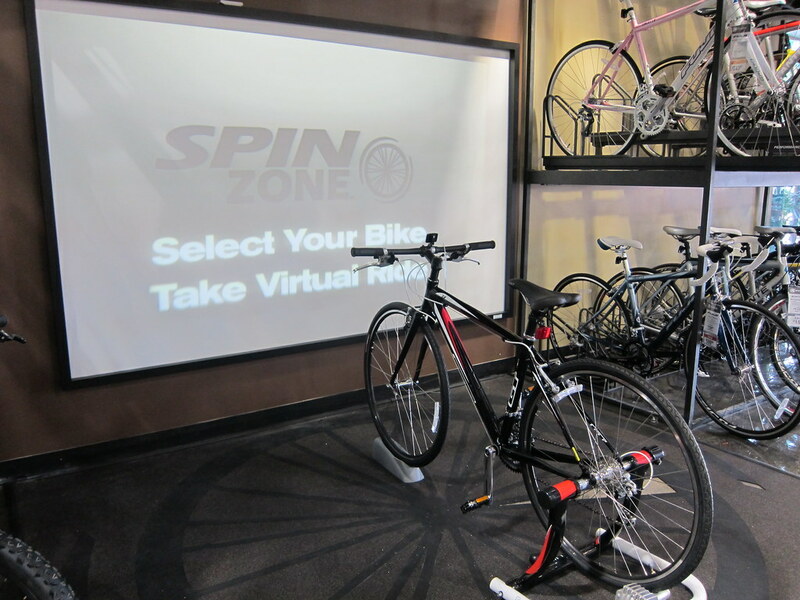 In between the racks of bikes, there was a Spin Zone virtual ride station. I was still waiting in line when Jay from Tri2Thrive arrived. I got really excited when I saw one of the prizes was a Hurricane HP Micro Mini Pump. When my turn came to spin the big wheel, I kept repeating that I wanted the Big Prize and I squealed when it actually landed on the red Big Prize wedge. I quickly grabbed the mini pump and Jay snapped a picture of me posing with my prize next to the lucky wheel. After a great deal of deliberation and consideration, I ended up purchasing a pair of chamois padded Pearl Izumi Sugar Shorts. The shorts were regularly priced $55 but they were on sale for $45. 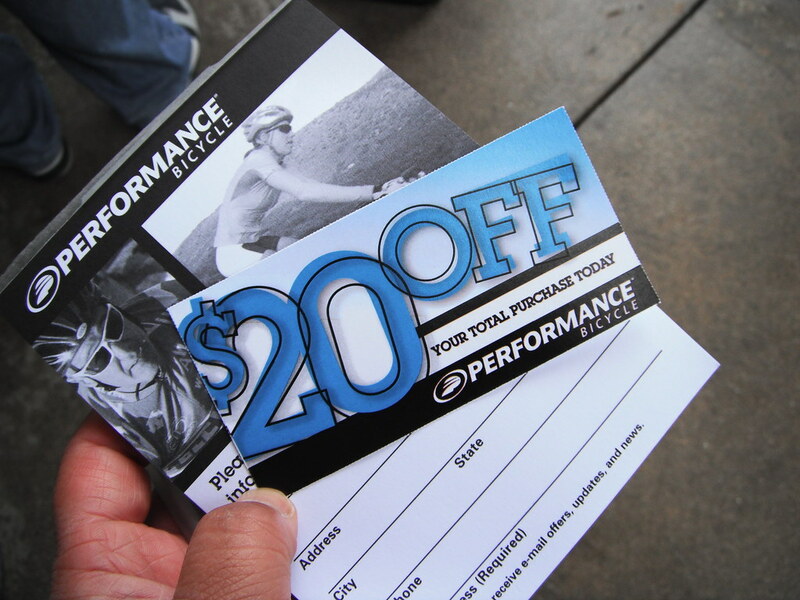 Performance Bike was taking 15% in celebration of the grand opening so combined with my $20 money card, the shorts came to $20. It was a fruitful grand opening visit for the Green Girl. Woohoo! Way to clean up. awesome!! waiting in the line totally paid off! thats so awesome!! :D congrats to you!! That's so cool! Shoulda bought a lottery ticket too! Sweet!! Congrats on your big score! WOO HOO!!! I'm going to have to try that...keep repeating I'm going to win the big prize. Nice shorts too and for $20. What a steal. I love Pearl Izumi shorts and $20-are you kidding?? Jealous! Good for you! yah !!! I was thinking and talking about you with Patrick. I wanted to see if you were doing the Tour of long Beach Saturday. But you know blogger freaked out, sooooooooooooo that never happened. gOOD news for you though.